It’s time to start recognizing the difference between truths & lies in our life. Why is it that when we think something bad about ourselves, we think it is true. And yet, when we think or say something good about ourselves, we have a hard time believing it. IT’S TIME FOR A PARADIGM SHIFT! – Truth comes from our Heavenly Father. – It gives us a good feeling & leaves us feeling uplifted. – It encourages us to always strive for the best within us. – It fills us with gratitude & gives us energy & hope. – All lies come from Satan, the “Father of Lies”. – Lies make you question your sense of self-worth. – They drain you of your energy & make you feel hopeless. – They make you believe you’ll never be good enough. If you’ve found yourself being weighed down by a heavy or negative thought lately, write it down on a piece of paper. Then cross it out with a big “X” & throw it away. Get out a clean sheet of paper & write down the opposite of that lie & label it TRUTH. Put it somewhere where you can read it daily. Anytime the old thought begins to resurface, replace it in your mind with the TRUTH that you’ve written down. Pray & ask your Heavenly Father to help you as you work on replacing these negative thoughts that pop up in your life. Remember: don’t spend your time dwelling on them, but when they do come up, quickly replace them with a truth from your Heavenly Father. I have done a variation of this . I write down what I find in the Bible about God’s nature. He is merciful. He is forgiving. And being His child I set an intention to imitate Him. Today I will show more mercy. Today I will practice forgiveness. I love this! Thanks for sharing Victoria! Trying this today. Thank you. Writing down the degrading lie about myself and crossing it out, is empowering. When I wrote the truth, it gives me confidence in myself and a good reminder. I also put the daily quote on the home screen of my phone so throughout the day I read your quote. I love that I am able to have the daily reminder of what I am to do and rid myself of negative thoughts. It’s so fun to see your name & comments again Ginny! I miss you!! Come visit me soon! Wow! This is powerful and exactly what I needed this morning- thank you! I wrote that I felt ugly and worthless, but the truth is that I am made in the image of God and he has given me worth. This 30 day challenge is setting up to be awesome! Thanks for doing it! Thanks for sharing your experience & this scripture Kate! It’s so encouraging to read others experiences & know that we’re all in this together & cheering each other on! I love this quote! I taught a lesson to the Young Women on this a few weeks ago! 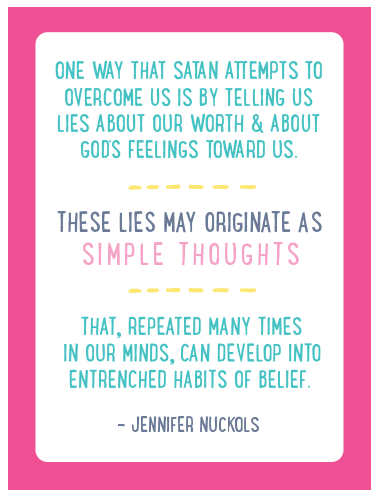 I use this exercise all the time to learn truths about myself — because Satan speaks to us in lies, I can turn what he says around, and learn another truth about myself!!! I did this today and it taught me that I am not how people talk to me. I am not a piece of trash or worthless. I am a confident woman who deserves to be treated as such. Yet, how can others treat me like that if I do not treat myself that way? I really need to remember this: I can do all things through Christ which strengthens me. Writing a lie and changing it by a truth was eye opening and definitively empowering. I was aware during the day of various lies that came to my mind and immediately changed them by thruths. It Is a great excercise that I will be doing today also. Thanks!!! But too my surprise it really did seem to help me deal with my negative attitudes lately. I know they are lies and I have wonderful people like my bf and my family telling me that everyday, but I just couldn’t believe it. The lie I wrote was that I feel useless. The truth I wrote was that I can do a lot of great things. I may not be able to do a lot of things I wish I could do, but the things I am capable of are pretty amazing right now!